You’re Going To Paris, Mom! A note to the reader: This column was first posted September 2014. I wanted to re-post it in memory of those who lost their lives November 13, 2015 as they innocently enjoyed a night in Paris… not knowing it would be their last. Paris, I love you. I think the only thing better than making dreams come true is when one of your dreams is actually making someone else’s dream come true. My mother has dreamed of going to Paris her entire life. From the time I was a little girl all I ever heard was my mom talking about one day hoping to visit Paris. She had studied French in school as a kid. She had ancestors from France. She loved French food. It was, quite simply, her one wish. But she never went and as life moved along and birthday candles moved along it seemed as if this would be one of those daydreams that would forever remain just that. A dream. I remember about 10 years ago when I sold a screenplay and it looked like it was going to get made I told my mom that maybe if the money came in I could send her to Paris. But the movie didn’t get made, the money didn’t come in and Paris would have to wait. Then, of course, I went through my years of financial stress and unemployment. I could barely buy a loaf of bread so… Paris? Sorry, mom. Don’t look at me. But for the last few years I’ve had the incredible gift of steady employment. As a single mom this has given me the ability to start a college fund, a savings account and a plan for my daughter’s future. And I can buy loaves of bread. About a year ago my mom took a fall and decided it was time to walk with a cane. I wondered if traveling would be too much for her anymore. I stopped thinking about Paris entirely. Yep. But if we go, we’re taking Grammie. Oh my god, mommy… she is going to freak out! We laughed and got goosebumps because we knew it was on. It was for real. It was time. It was strange. Just like that I decided. It was as if a voice whispered, Don’t think just do this. You have the money. You’ve worked hard to save. You can do this. And, if not now, when? You don’t want to wait until it’s too late and you’re filled with regret for not having jumped. Trust. The net will indeed be there to catch all three of you. So, with tickets booked, hotels reserved, tours set my daughter and I knew it was time to tell my mom the big surprise. Gosh, don’t you wish we were really in Paris eating this? Well, mom, we will be. And as I revealed the news that come spring I would be taking her and my daughter on a first class, all expense paid trip to Paris my mother’s face went from an 83 year old woman to a sixteen year old girl who just found out her biggest dream was coming true. The moment was powerful, emotional, joyful, beautiful. And my daughter caught it all on tape. I don’t know what about all this is most incredible. The fact that I’m in a place in my life and my career that I can afford to do something like this. The fact that I am giving my mother a lifelong dream. The fact that my daughter will remember this for the rest of her life — as I remind her that I never even got to meet my grandmother on my mom’s side because she passed away before I was born. Yes, all of that is truly amazing. I’m taking you to Paris, mom. Thank you. 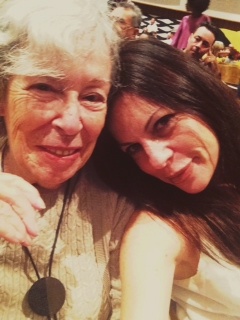 Thank you for being my mom, for being my daughter’s grandmother, for being there for my friends and their kids, for your sobriety, your kindness, your generosity and your spirit. You deserve nothing less than having your childhood wishes come true. Yes, there are dreams… and then there’s Paris. A marvelous gift given from a grateful heart — and received with grateful hands! Love it!!! Lovely story, Susan. Dreams do come true. You’re mom is gorgeous and what a beautiful moment! Enjoy and bon appetit ( I don’t know French, this was the best I could do)!!!! aww, i think she’s gorgeous too! thank you, sharon!